Hello ... Hello ... my old friends ... It's great to see you once again! The final match of the September 2013 UK tour by The Duckworth Lewis Method could not have been at a better and more apt venue than that of The Glee Club Birmingham yesterday [Sunday 29th September]. Amidst much tomfoolery within the ranks of a truly superb live band in their element, last nights gig in the Midlands heartland of The Idle Race, The Move and ELO inspired the quirky cricket pop fivesome to a live performance that was not only note perfect but replete with comedic and downright amusing banter between Neil Hannon, Thomas Walsh and Tosh Flood. The tidy and impressive support set by John Cunningham, the latter half in tandem with the DLM half of the beloved Pugwash, provided the perfect springboard for the evening as we were treated to songs from his latest album "Happy Go Unlucky" in a suitably intimate environment. If the Nottingham gig back on 9th July was atmospheric then this concert was that, longer, expansive and then some as Neil Hannon [Vocals/Keyboards/Guitar], Thomas Walsh [Vocals/Guitar/ Kazoo], Tosh Flood [Guitar/backing vocals], Simon Little [Bass/backing vocals] and Tim Weller [Drums] bounded on to the stage to that familiar cricket anthem: "Soul Limbo" and then proceeded to bat through the majority of the their eponymously entitled 2009 debut album and their latest innings "Sticky Wickets". This was the first gig in Birmingham for Thomas Walsh and the evening was filled with his effervescent enthusiasm for all things: Idle Race, The Move, Jeff Lynne, Roy Wood and ELO as he paid due homage to two of his Idle Race heroes: Dave Pritchard and Roger 'Ollie' Spencer, who were in the audience. The stage antics of Tom and Neil on the subject of their mutual musical admiration - one almost silent and the other unable to hold back his obvious delight - were truly cherished moments for the packed venue. This amusing yet touching arrival at DLM's musical roots meant that the evening was often interspersed with short passages where Tom, on the spur of the moment, started impromptu covers of the likes "Lightning Never Strikes Twice" and "Flowers In The Rain" [The Move]; "The Way Life's Meant To Be" [ELO] as well as "End Of The Road" and "Please No More Sad Songs" [The Idle Race]. Indeed, it was a night of musical education as much as the evening was a concert. The encore was so very special as it included a full DLM performance of "On With The Show" dedicated to the watching Idle Racers: Dave Pritchard and Roger 'Ollie' Spencer. 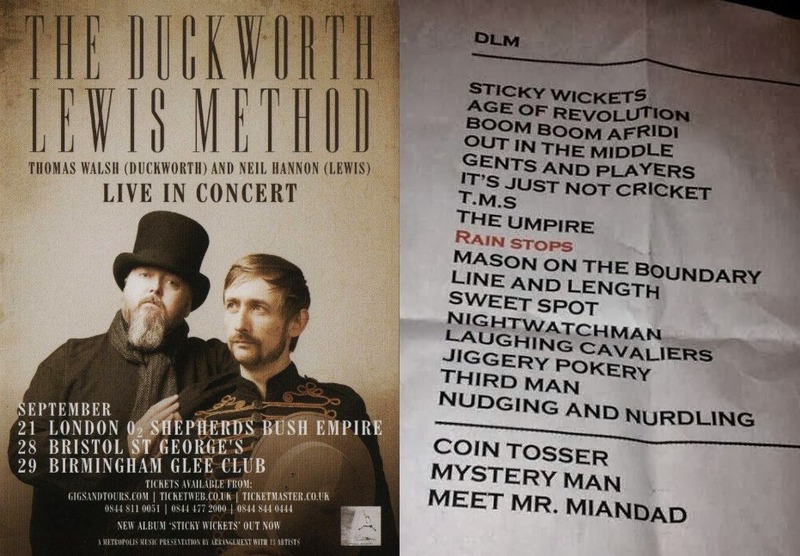 I have had the great pleasure this year of at last seeing: Pugwash in the flesh as well as attending two excellent Duckworth Lewis Method gigs. My admiration of Neil Hannon and The Divine Comedy continues to grow as does my regard for Thomas Walsh, Tosh Flood and Pugwash. ELO Beatles Forever [ELOBF] recommends "Sticky Wickets" by The Duckworth Lewis Method to all folks who enjoy the music of ELO, Jeff Lynne, Roy Wood, The Move, The Idle Race, 'Brum Beat', The Beatles and related artistes.